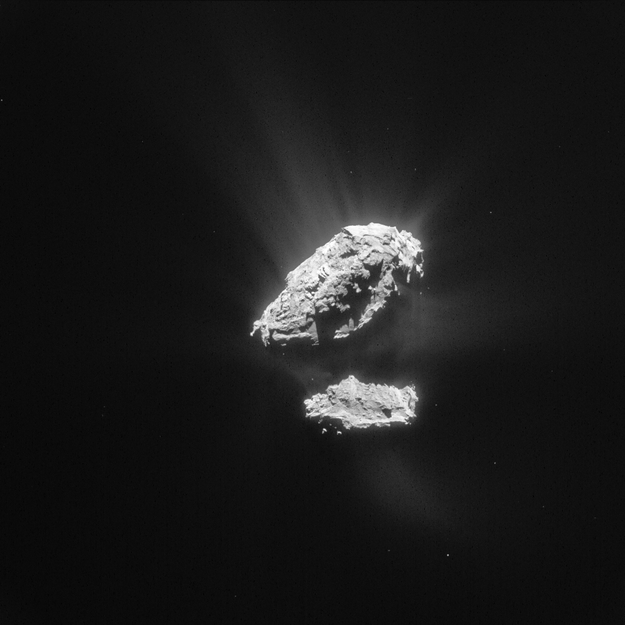 Comet 67P/Churyumov-Gerasimenko in May 2015, the same month that Rosetta also made the first detection of the organohalogen methyl chloride, CH3CL with its ROSINA instrument. In May 2015 Rosetta was between 1.7 and 1.5 astronomical units from the Sun, just outside the orbit of Mars. Its closest approach to the Sun, 1.2 AU, was reached three months later, in August. The increasing heat warmed the ices on the comet's surface and released gas, dragging dust out with it to create the comet's fuzzy atmosphere. This single navigation camera image was taken on 23 May 2015 from a distance of 138.1 km from the comet centre. The image has a resolution of 11.8 m/pixel and measures 12.1 km across. This image has been enhanced to bring out the details of the comet's activity. The original image is available in the Archive Image Browser.